Once upon a time there was a little boy, a brave and strong little boy. He wasn’t afraid of anything. He rode his bike as fast as lightning. He started a new school and made lots of friends the first day. He’d stick his tongue out at noisy barking dogs. He liked being fast and friendly and brave. Until, he got a visit from….a monster! Monsters pay surprise visits to most children. They are queued up in the wings of every child’s imagination with a long procession of characters from children’s books and stories including Santa Claus and the Tooth Fairy. Monsters co-exist with “reality” in the magical world of childhood where talking dogs and flying carpets are as likely as stars at night and rainbows after a storm. Children believe. Clap your hands and Tinkerbelle lives. The problem is that thoughts are “real” to young children whether they are happy, magical thoughts or crazy, scary ideas. Children believe if they think it, it’s true. Monsters are “real” to kids. Monsters are the name children give that feeling they have when they are alone and worried something might steal them away from a safe place and drop them off, cold and hungry, in a dark forest. 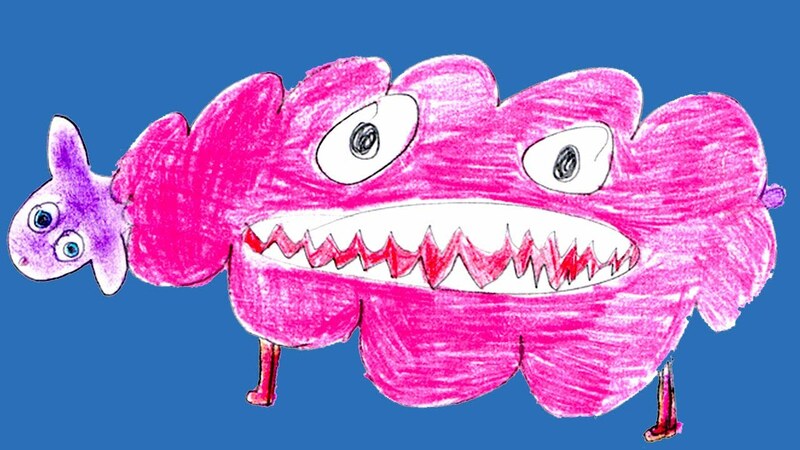 Monsters arrive in childhood as children make new connections between ideas and experiences. It’s possible to a young child that mommy can be eaten by “the dark” or a 43 pound preschooler can inadvertently slip down the bathtub drain – and no amount of adult reason will prove otherwise. Learning is trial-and-error and monsters rush in to fill the gaps between what is known and what is unknown. As parents, you can expect the monsters. Be prepared with age-appropriate strategies that fit into your child’s magical thinking. Your child will learn to be strong and brave with your support. Eventually, your child can face any old monster. Children gain emotional control over situations when they can predict the future. Order builds self-control. Consistent bed times and routines are essential for young children. Make sure your child is an active participant in the routine, especially when fears are building. 1. Have your child draw an invisible monster-catching net in the doorway to her room before lights-out. 2. Have your child draw a “No Monsters” sign to hang the bedroom door and shout out the message to the north, south, east and west. Include some serious foot stomping with the shouting. 3. Give your child a spray bottle with “monster spray” (thanks Dr. Melanie Bazarte for sharing this tip in a Parenting 101 seminar). 4. Give your child a “monster flashlight” or teach your child a “monster clapping song” like Go Away Big Green Monster currently running on YouTube. Holding a special object helps children to feel less alone. From teddy bears to blankies, generations of children faced the dark with a trusted companion. Loveys are not crutches; they are powerful tools that give children tangible support. 1. Pick one special lovey. If your child is old enough, he can pick out his favorite. 2. Integrate the lovey into the bedtime routine – kiss the lovey-bear and tuck him in bed too, tell the lovey-bear to watch over the room, or wave the lovey-blanket like a bull fighter shielding your child from all danger. Emotions are always more challenging when your child is tired and alone. Use the power of pretend play to build confidence and resourcefulness during the day. 1. Read empowering children’s books about monster books (see sidebar) or stage puppet shows with brave-and-strong puppets scaring off mean, scary monsters. 2. Use laughter to build courage. Act like monsters stomping feet and howling loudly. Children learn a lot about emotions when they pretend to be scared and scream like they’re being chased. Pretend play shines light on dark emotions. 3. Practice being in the dark. Get silly playing “bump in the dark”. Make a game of walking around a dark room to find a glow-in-the-dark-star (or use a blindfold while trying to find teddy bear). Keep that star (or teddy) at your child’s bedside at bedtime. Parents are the role models for calm and strong. Fears can be extremely upsetting to parents and frustrating too. Believe in your routines and in the power of time to reassure your child that everything really is okay. If you get angry or impatient, you’re only adding to your child’s vulnerability. Use guided imagery to help your child visit “happy places” before bedtime. Teach your child belly breathing by showing him how the tummy blows out like a balloon during inhale and deflates during exhale. Use relaxation techniques like tightening and relaxing the muscles from her toes to her forehead to prepare your child’s mind and body for sleep. Next time your child says “I’m scared”, you’ll know what your child needs – strength, confidence and experience that only comes from boldly facing those monsters in a child’s world. And before you know it, monsters give way to grown-up things and children become parents saying to their children “there’s really nothing to worry about”!